A thread of protection, Mauli Rakhi is known to mark the beginnings of festivities auspiciously. This Raksha Bandhan, you can safeguard your brother and keep him safe from all evils with FlowerAura’s Mauli Rakhi that is curated just for him. Since the times beginning, a thread of protection was tied on the wrists of god and goddess. These were the threads of protection, promise, and perseverance and were basically tied to keep bad omens and evil at a distance. Later, these transformed and were tied on the wrists of kings and warriors during wars. The tradition continued and it was proclaimed in Hinduism that a red thread was tied to give an auspicious beginning or to safeguard a dearest one. Also, called as Mauli, this red kalava began to be a part of religious rites, ceremonies, and traditional events. 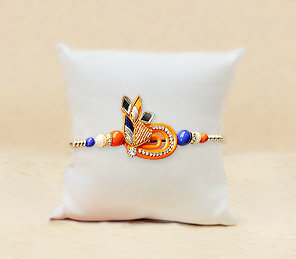 And with few instances where queens have tied these on the wrists of their brothers, this tradition became a prominent part of Raksha Bandhan with the instance of Draupadi and Krishna, where Draupadi saved Lord Krishna when he was hurt and later, Lord Krishna came to her rescue during the game of dice. Thus, tieing Mauli Rakhi comes with a deep-rooted significance and you can keep it alive by tieing one on your brother's wrist this year. Don't worry, you don't have to go back to the ancient times, as these are available right at your fingertips. Yes, FlowerAura, India's leading florist, an online gifting portal is brimming with innumerable Mauli Rakhis for a brother that can be sent anywhere across India, even to the remotest corners of any city. So, if you wish to send Rakhi to Chennai, Mumbai, Delhi, FlowerAura's delivery options avail you to couple it along with many other Rakhi gifts and send you wishes of well being right away. Mauli Rakhis are generally red in color. The red color symbolizes strength, protection, bravery against all evils. Tieing a red Mauli thread can safeguard your brother and protect your sibling bond forever. However, these are also, incorporated in many other rainbow colors, like orange and yellow. While the significance remains the same, the color of a Mauli Rakhi changes. Further, along with the color, Mauli Rakhis are now detailed intricately with prettiest details, stones, gems, and other decorative embellishments. Thus, making each thread, pious as well as fancy. The magnificence of these Rakhis is heightened when these are beautifully adorned on a brother's wrist. So, what are you waiting for? Send Rakhi for brother right away and don't forget to add a puja thali, Rakhi hampers, chocolates, dry fruits, sweet delicacies with it. This year has come will a lot of happiness and a lot of difficulties. Happiness that came with the news that your brother got promoted and the difficulty that he is moving to another city, leaving you and other family members behind. However, with Rakhi around the corner, are your days filled with the fear that you might not be able to celebrate like you used to? Or are you scared that with no Rakhi celebration, you and your brother will lose your siblinghood charm? Well, hold up because, with FlowerAura at your fingertips, you will be able to celebrate Raksha Bandhan like you used to. In fact, this year you might be able to more sparkles to it. All you need to do is visit FlowerAura's online portal and order online a Mauli Rakhi after browsing through a wide array of it. Once, you make the payment, the confirmed order will cater to uplift spirits of your brother residing far away from you and the hassle-free delivery services will be able to warm the heart of the brother by hand-delivering the Rakhi gift on time. Flowers, cakes, chocolates, your hand picks will be sent anywhere in India with FlowerAura.